Most people who attend concerts never dare dream that they will join their musical idols for a performance on stage. However, when Kristi Reeves, 30, of Havertown, Pa., heard this invitation from Idina Menzel go out to the packed crowd, she knew she couldn’t pass up the opportunity and she enthusiastically threw her hand up in the air in the hopes that she would be chosen. 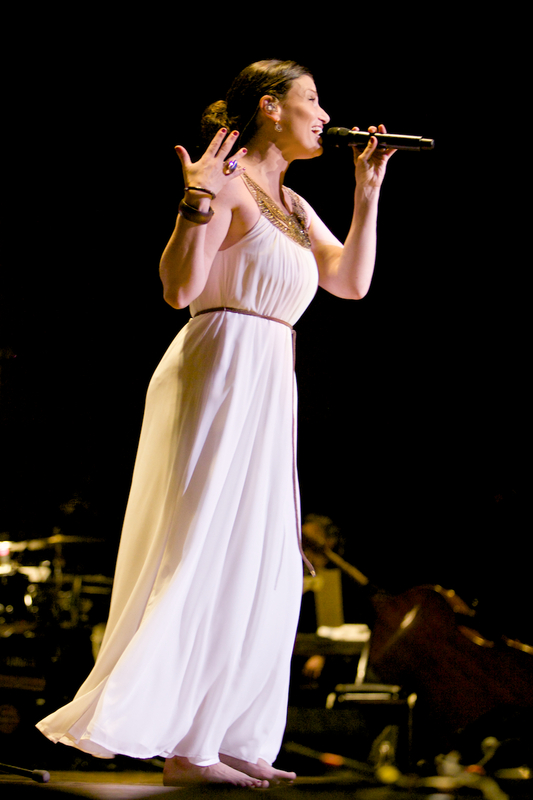 Menzel appeared at the MannCenter for the Performing Arts on June 30 in her Barefoot at the Mann show. Menzel is best known for her roles in the Broadway musicals Wicked and Rent as well as Rachel’s mother on the hit TV series Glee. Reeves is a long-time Menzel fan. “She is my idol! I generally try and never miss a performance when she is in town because I know it will be amazing,” said Reeves. “I was first introduced to her as Maureen in Rent, and she was awesome, but when she played Elphaba in Wicked it was like watching something really special. She truly has a gift with that voice of hers. So definitely Elphaba is my favorite role that she has played, I even named my dog Elphaba after her character,” said Reeves. This was Reeves’ second time to see Menzel at the Mann. While Reeves was shocked to find herself performing with Menzel this time, the crowd was also surprised at the caliber of Reeves’ vocal talent. Reeves previously trained with Harry Dietzler and Christopher Sapienza at the Upper Darby Performing Arts Center with Summer Stage and Shooting Stars. All of that training paid off as Reeves’ strong voice soared with Menzel’s and they wove together for an enjoyable performance. When asked about how she felt during the duet, Reeves’ eyes lit up as she responded. “(This experience) shows just how amazing Idina is, that she puts her own trust in her fans to perform songs with her that she is so known for,” said Reeves. Although she has no specific show in mind, Reeves has no doubt that she will be back at the Mann for another concert. “Being on stage at the Mann was awesome, I could get used to that! 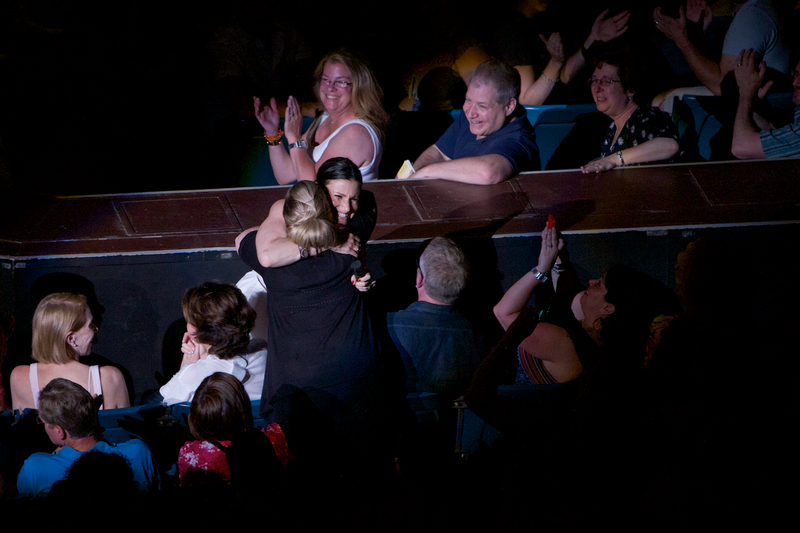 Being on stage with Idina? That was an honor and I can only hope and pray that one day she would want to add back-up singers to her show!” gushed Reeves. This entry was posted in Music and tagged Broadway theatre, Elphaba, Idina Menzel, Mann, Menzel, Performing arts, Rent, Wicked by S.D. McPhail. Bookmark the permalink. I have known kristi since she was 5 years old and cannot imagine a more deserving fan to share this experience! I’m just hoping there was a scout in the audience to give Kristi her big break!